sequestration of calcium, production of steroids, storage and production of glycogen, and insertion of membrane proteins. The first part of this presentation will focus on rough endoplasmic reticulum which gets its name from the presence of ribosomes on its surface. 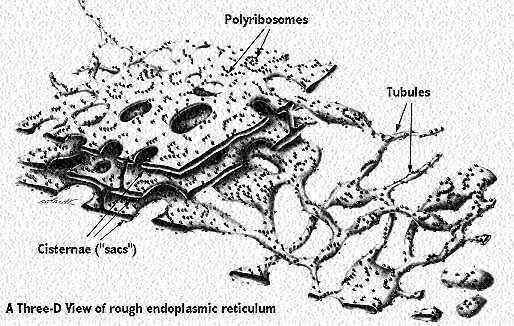 Rough endoplasmic reticulum bears the ribosomes during protein synthesis. The newly synthesized proteins are sequestered in sacs, called cisternae . The system then sends the proteins via small vesicles to the Golgi Complex , or, in the case of membrane proteins, it inserts them into the membrane. As shown in this diagram, rough endoplasmic reticulum may either be vesicular or tubular. Or it may consist of stacks of flattened cisternae (like sheets) that may have bridging areas connecting the individual sheets. The Ribosomes sit on the outer surfaces of the sacs (or cisternae). They resemble small beads sitting in rosettes or in a linear pattern. Rough endoplasmic reticulum forms a branched reticulum that expands as the cell becomes more active in protein synthesis. Sometimes the reticulum branches out. Other times, the cisternae dilate and form large sacs that fill the cell. This photograph, taken from your text, shows the reticulum delineated by immunolabeling for newly synthesized protein (labeled fluorescent blue in this photo). Test yourself!! What do you already know about ribosomes, rough endoplasmic reticulum, the Golgi Complex and Lysosomes? Where are ribosomes produced and how do they get to the cytoplasm? What key events occur at the site of the ribosome? As translation of mRNA begins, where is the mRNA placed? What are polyribosomes and what is their function? How would you recognize them? How do ribosomes interact with the rough endoplasmic reticulum ? What is the site called? Where is the growing polypeptide placed? What peptide is produced at the beginning of translation and what is the significance of this peptide? Why wouldn't you find such a peptide in a set of polyribosomes that are free in the cytoplasm? What happens to the peptide after it is produced? How and where are membrane proteins inserted in the membrane? How are multipass transmembrane proteins inserted and aligned in the membrane? What factors might regulate or dictate the direction of the alignment? How do proteins destined for secretion or insertion into the plasma membrane get to the Golgi complex ? What coats the vesicles and what is the vesicular-tubular complex? Define the regions of the Golgi complex What histochemical markers would you use? Distinguish the types of secretory pathways through the Golgi Complex. How does the Golgi complex regulate or maintain the orientation of membrane proteins ? Where are carbohydrates added to glycoproteins? Can proteins be transported back to the rough endoplasmic reticulum from the Golgi Complex? What would happen to rough endoplasmic reticulum proteins if this process were blocked? What are lysosomes and how do they function in the cell? How and where are lysosomal enzymes sorted ? What are major distinguishing features of lysosomes and peroxisomes ? How would you distinguish smooth endoplasmic reticulum from rough endoplasmic reticulum? For fun: Use the Links to outside web pages to learn more about the role of chaperones in protein synthesis. What are they? Give one example and state where it works in the process.